In August, the Undergraduate Advising and Academic Programming Office (UAAP) welcomed 1,099 new first year students to campus at Orientation. Nearly half of them—583, to be exact—arrived on campus before Orientation formally began to participate in one of the 26 Freshman Pre-Orientation Programs (FPOPs). Students explored programs in 22 academic disciplines as well as leadership, the arts, service initiatives, and the outdoors. With 80 enthusiastic Orientation leaders guiding the way, the week began on Sunday, August 27, with some fun and games. The kickoff event featured a rousing game of Family Feud, in which new students took on a team of leaders. The event also showcased a collaboration with the nonprofit Advanced Functional Fabrics of America (AFFOA), which provided new students with the world’s first programmable backpacks. Throughout the week, the Class of 2021 attended a number of events designed to address many important first year issues, including President Reif’s remarks at Convocation, Tech Theatre, Diversity Orientation, and the “By Students, For Students: Conquering MIT” program, which highlights stories of students’ challenges and successes. In terms of academics, first year students learned about the GIRs from Vice Chancellor Waitz at the annual Core Blitz program and interacted with departments at the Academic Expo. They all had a chance to meet with their academic advisors and associate advisors before registering for their first semester of MIT classes. To celebrate the end of a successful week, the class traveled to the New England Aquarium for a night of entertainment, food, and fun! 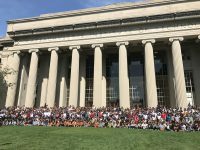 Overall, this year’s Orientation program was a success, thanks to the dedication and hard work of many faculty, staff, student leaders, and members of the MIT community!